Red Orange Flowers with Butterflies by Karen Tusinski. The featured artist this week, August 25 through 31, at Dragonfly Gallery in Oak Bluffs is Karen Tusinski. Ms. Tusinski’s work focuses on the many ways one can look at a single item. For example, the depiction of an ordinary table or flower arrangement, examined from several angles, then comes together as a single image while still retaining the multiple perspectives. She does this does this by illuminating the shapes and colors that represent each of these angles. But don’t take our word for it — after all words too are subject to multiple layers of meaning. Far better to see for yourself with your own multiple sets of eyes. 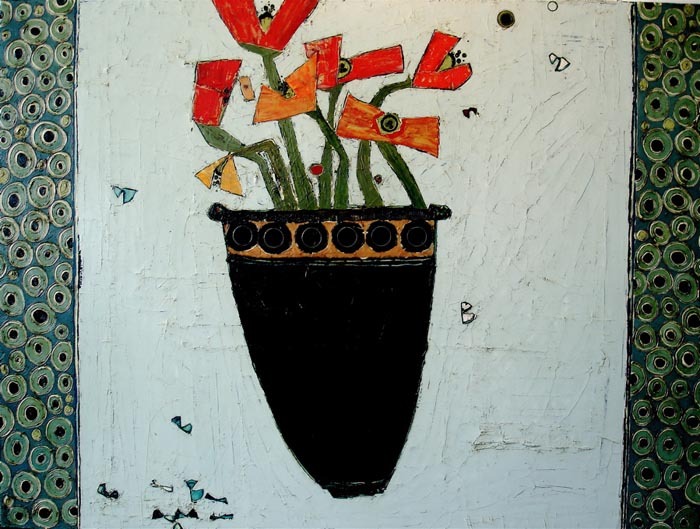 The Dragonfly Fine Arts Gallery is open daily from 11 a.m. to 6 p.m. For more details, call 508-693-8877 or visit mvdragonfly.com.